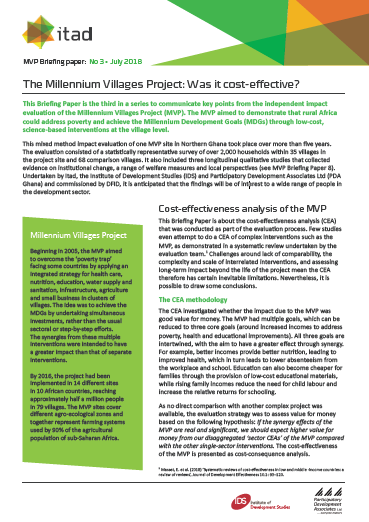 This Briefing Paper is the third in a series to communicate key points from the independent impact evaluation of the Millennium Villages Project (MVP). The MVP aimed to demonstrate that rural Africa could address poverty and achieve the Millennium Development Goals (MDGs) through low-cost, science-based interventions at the village level. This Briefing Paper is about the cost-effectiveness analysis (CEA) that was conducted as part of the evaluation process. Few studies even attempt to do a CEA of complex interventions such as the MVP, as demonstrated in a systematic review undertaken by the evaluation team.1 Challenges around lack of comparability, the complexity and scale of interrelated interventions, and assessing long-term impact beyond the life of the project mean the CEA, therefore, has certain inevitable limitations. Nevertheless, it is possible to draw some conclusions.